When Do Cows' Permanent Teeth Erupt? Cattle have eight incisors, or biting teeth in their bottom jaw. They have no incisors in the upper jaw, just a hard pad. Well back in the mouth they also have pre-molars and molars in both the upper and lower jaw, but these are rarely seen. Cows have milk teeth when they are born and these are lost in a well-defined order when the permanent teeth erupt. This normally begins as young as 18 months and continues to around age five. Milk teeth are short and broad with a bright ivory color. There is normally a big gap between the middle two teeth. Permanent teeth can start erupting from about 18 months of age. A tooth is regarded as erupted once it has broken through the gum. The milk teeth become loose and the gums swell, and then the permanent teeth erupt while the milk teeth are still present. They will usually start off at an angle, and then straighten once the milk teeth have dropped out. The middle pair of teeth, called the central incisors, are always the first permanent incisors to erupt. This normally happens at age 18 to 24 months, but can be as late as 34 months. The teeth next to the central incisors are called the middle incisors and usually erupt from 24 to 30 months, but can be as late as 40 months. The teeth next to the middle incisors are called the lateral incisors and usually erupt from 32 to 36 months, but can be as late as 47 months. The outside incisors are called corner incisors and usually erupt from 42 to 48 months, but can be as late as 58 months -- nearly five years old. 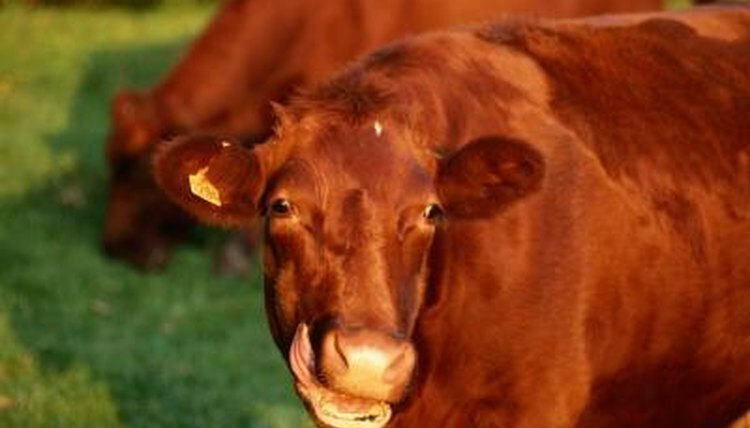 Cows have a total of 12 pre-molars and 12 molars. The molars are the rearmost three teeth in both sides of the upper and lower jaws. These are the strong teeth used to grind up grass and any other feed. The first two permanent molars erupt from around 12 to 18 months while the furthest back molar erupts at 24 to 30 months. The second pre-molar usually erupts from 18 to 30 months, the first one (closest to the front of the mouth) from 24 to 30 months and the third one from 30 to 36 months.